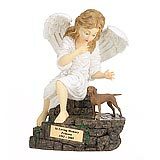 "Maggie´s urn did arrive and is beautiful....thank you so much for all of your thoughtfulness and personal attention. Have already told all of my "animal" friend lovers about your service and when their time comes, I am sure they will be in touch with you." 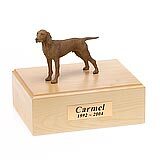 All available Vizsla dog urns and memorials will be displayed with the figurine on the Vizsla urn you select and in the appropriate size.